This machine is used to collect the sod peat from the spread ground into a rick clear of the spread ground. The machine consists of a plate / chain conveyor extending the full width of the spread and elevates over the tractor unit where it discharges the sods onto a short screen conveyor and in turn onto the rick. The main conveyor is supported on caterpillar tracks for its horizontal length and the elevator portion is supported on the tractor unit. The short screen conveyor is also supported on the tractor unit. The tractor unit has two caterpillar tracks and supports the electric driving motor and worm gearbox which powers the whole machine. The final drive to all caterpillar tracks on the tractor unit and conveyor is the adjustable ratchet type. The conveyor is loaded by automatic elevator from prepared windrows or in some cases by hand from hand footings. This machine is powered by a diesel engine on bogs which have no electricity available. The automatic elevators are scraper type elevators supported at the top on a pivot beam from the main conveyor and on the bog by adjustable ground rollers. The scrapers of each elevator are driven independently by an electric motor and gearbox. The units are supported on the main conveyor, over the caterpillar tracks. 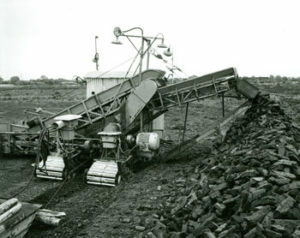 The elevators are forced into the windrows spaced at 9 metres, the scrapers elevate the sods discharging them onto a fixed bar screen from which they bounce into the main conveyor. This machine has the special features of being light, easily manoeuvrable and low maintenance. Basically the machine consists of a tractor unit carrying across it a belt conveyor, the extensions of which are supported on wire ropes from masts on the tractor unit. The tractor unit or main machine is lightly constructed and carried on caterpillar type power driven tracks. A selection of eight forward speeds and two reverse speeds are available through an automobile 4 speed gearbox and two chain drives with dog-clutch control. The power unit is a standard diesel power-pack. The machine is steered by coil clutch / brake arrangement. The conveyor is made up of four separate sections; a section built on the main machine; a section on either side of the machine which is approximately in the horizontal position when working, and an elevator section at the discharge end. The drive from the main machine is through reduction gearbox, using automobile rear axle gears, to the driving pulley of the section on the main machine. The drive to other sections is transmitted through the conveyor belt itself and short chain drives between the end rollers of the sections. Adjustment of all conveyor belts and chain drives is provided. 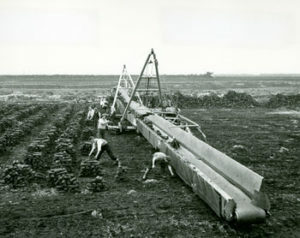 A system of wire ropes from ‘A’ frames mounted on the main machine, control the position of the conveyor sections relative to the bog. These ropes are actuated by hydraulic rams. When travelling idle, the side conveyors are hoisted to a safe angle to allow movement over uneven ground and to clear rick ends and other such obstacles. This machine with shorter conveyor is used for collection of sod peat and peat moss sods from shorter spreads. A Ridger Tractor was used to perform the ridging operation much faster than the other tractors. Read More.